As part of its studies of the plants and animals found in Cambridge we would like to know where snakes and lizards are seen. There are six native species of reptiles in the UK; this includes three snakes and three lizards. Two of these species, Sand Lizard (Lacerta agilis) and Smooth Snake (Coronella austriaca) live outside of Cambridgeshire and another two are extremely rare within the county. 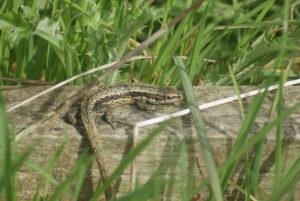 You’re most likely going to find the viviparous lizard (Zootoca vivipara) and the grass snake (Natrix natrix) which are both widespread throughout Cambridgeshire. Reptiles are sparsely distributed due to the extent of habitat modification we’ve undertaken to develop land for housing or agriculture. The viviparous lizard (also known as the common lizard) is a widespread species although it is currently facing declines. Adults can be up to 15cm in length although some may be shorted than this if they have shed their tail in an attempt to avoid predators. Hatchlings are about 4cm long and jet black in colour whilst adults are brown to tan. The species can often be seen basking in the open on logs, fences and south-facing banks as long as it is close to dense vegetation. They emerge from hibernation in late February or early March, mating takes place around April and young are then born in August before the species disappears in October as they go into hibernation for the winter. 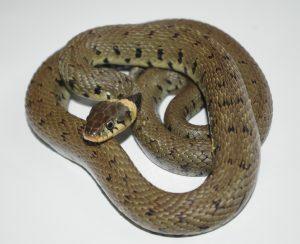 The grass snake is the UK’s largest snake growing to 150cm or more in length. They are often an olive colour and can be distinguished by their black and yellow neck collar. Feeding primarily on amphibians, they are usually found close to water and gardeners often find them in and around compost heaps where they sometimes lay their eggs. They are wary of people and will move off quickly if disturbed. They emerge from hibernation in March or April before breeding around May. Eggs are laid in June with hatchlings being seen in August or September. The species occurs across a range of habitats but has declined in recent years as its prey has. The adder is infamous for being the UK’s only venomous snake; it has declined in recent years as its heathland habitat has been developed. They have a distinctive zig-zag pattern and V-shape on the neck. They can grow to about 70cm in length although hatchlings are only around 17cm. Males are typically a grey-silver colour and females are brown although both sexes are highly variable in colouration. Adders are usually found in the spring and autumn when basking near their hibernation sites. They mate in April and give birth to young in August; they’re our only species of snakes that don’t lay eggs. They shouldn’t be approached and it is very unlikely that they will be seen as their associated habitats no longer exist in Cambridgeshire in any quantity to support viable populations. 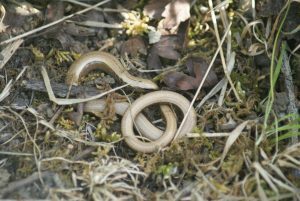 The slow worm is a species of legless lizard and is often mistaken as a snake; they are very shiny in appearance and grow to 40cm or longer. Hatchlings are a light gold in colour with a jet black dorsal line and underbelly. Adults are usually a brown to copper colour with females retaining the dorsal stripe. They are active from March and breed between April and May before giving birth in the late summer or early autumn. They occur throughout a wide range of habitats and bask in the open far less often than our other reptiles, partly due to their semi-fossorial lifestyle. The red-eared slider is a non-native species that was popularised in the mid-1990s as a pet following the release of the Teenage Mutant Ninja Turtles. They quickly outgrew their owners welcome and were often dumped in local waterways. As they are long-lived, the individuals encountered today are almost certainly relicts of that time. 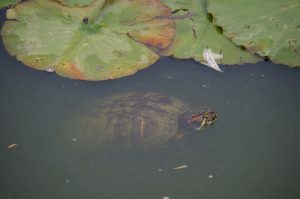 They are unmistakeable as we have no native freshwater terrapins in the UK although there are 22 species that have been recorded to have been introduced; the red-eared slider is by far the most numerous. They can often be seen basking on banks or logs and are active between April and October. WHERE you saw the reptile. Be as specific as possible for your sightings, for example giving street and house number, or even better a national grid reference. WHEN did you see it? Please give the exact date (day, month, year). Notes on the HABITAT where you observed the reptiles. Please let us know if you have photos.